ATM Marketplace is pleased to present new blogger Rebecca Cicarelli, Director of Marketing at BranchServ, a provider of customized security and automation solutions for financial institutions. If you are interested in publishing a bimonthly blog for ATM Marketplace on topics related to self-service systems, customer experience or branch transformation, contact the editor today! Microsoft Windows, long hailed as the gold standard operating system for PCs and other hardware, has been through several iterations since its debut in 1985. Some updates were hits, others were (big) misses — perhaps none more lambasted than Windows ME, panned by the likes of PC World, Wired and just about every other computer software publication. Luckily, Windows 10 appears to have won over the critics and has quickly been adopted by consumers and businesses alike. Industry authorities have been urging banks and credit unions to make the switch for a while now. Although some have already made the transition to Windows 10, many have decided to wait it out. 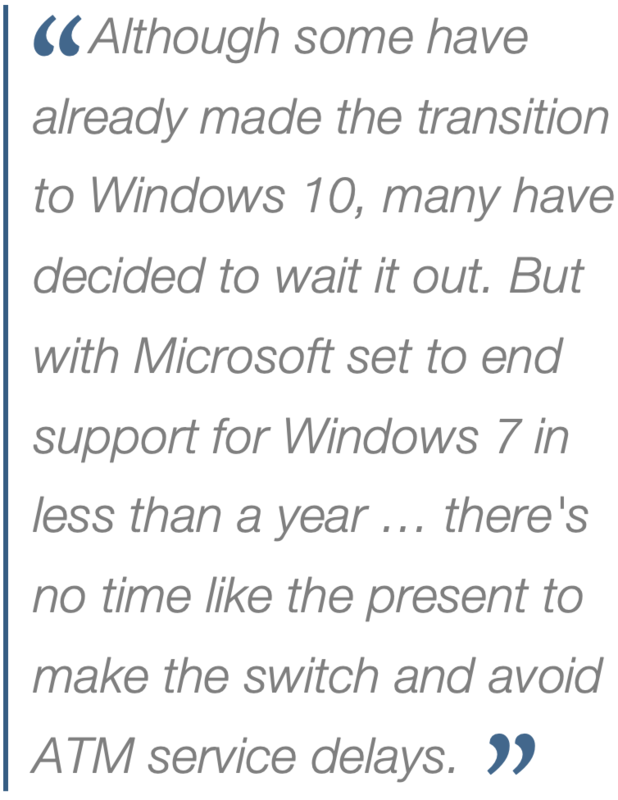 But with Microsoft set to end Windows 7 support in less than a year — Jan. 14, 2020 is the cut-off date — there’s no time like the present to make the switch and avoid ATM service delays. You’ve probably heard a little of this and that about Windows 10. Sure, it has expanded functionality, state-of-the-art security features, an intuitive UX, the whole package. But what about the bottom line for bank branches and credit unions? What’s the upshot of Windows 10? By virtually all indications, Windows 10 represents a significant improvement in performance and ease of use compared with its predecessors. So much so that ATM producers have shipped Windows 10-enabled processors for going on five years, according to ATM Marketplace. These same developers have also offered webinars so that banking professionals can quickly learn how the OS functions differently than Windows 7. There’s always a bit of a learning curve for new software, but it’s a short one for Windows 10. And since it’s been out since 2014, Microsoft has had plenty of time to work the kinks out so the transition is seamless. In addition to greater functionality and ease of use, the security features of Windows 10 are second to none. In recent years, ATM fraud has risen, up 39 percent in the first half of 2017 compared with the corresponding period in 2016, according to FICO. This has led to the introduction of cardless functionality at more ATMs, but these machines can still be compromised. Thanks to multifactor authentication, contactless and biometric technologies, and physical-to-digital integrations that allow users to sync their portable devices to ATMs, Windows 10 promises to bring added security to users’ daily transactions. Studies conducted by the ATM Industry Association indicate that Windows 10 is particularly adept at identifying malware and cyberattacks in general. This may explain why the ATMIA advised banks and credit unions to begin OS migration shortly after Windows 10 was released to the public. Who will be affected by Windows 10 migration? In a word, everyone. With Windows OS overwhelmingly the industry standard for financial institutions, there’s no escaping the rollout of Windows 10 — or, more accurately, the discontinuation of support for Windows 7 (more on that in a bit). From a technical perspective, the answer is no. The switch isn’t legally regulated or mandated, just as there’s no legal imperative for a person to upgrade their smartphone every time the latest iteration is released. But unlike junking your old iPhone in favor of a new model, there can be serious consequences associated with not migrating to Windows 10: You’re putting your customers — and your bank — in serious jeopardy by sticking with your current OS. For starters, the Jan. 14 deadline is very real; after that point, Microsoft won’t be able — or willing — to help you with any troubleshooting concerns, nor will it release security patches. Even third-party vendors are likely to turn from the outdated OS, given the lack of support resources. This leaves holes in your security and service network which, if one of them should result in a full-scale data breach, can lay waste to your bottom line, reputation and customer loyalty. What should I do to make the switch? Change is challenging, but necessary, given the pace at which technology develops and customer satisfaction can wane. 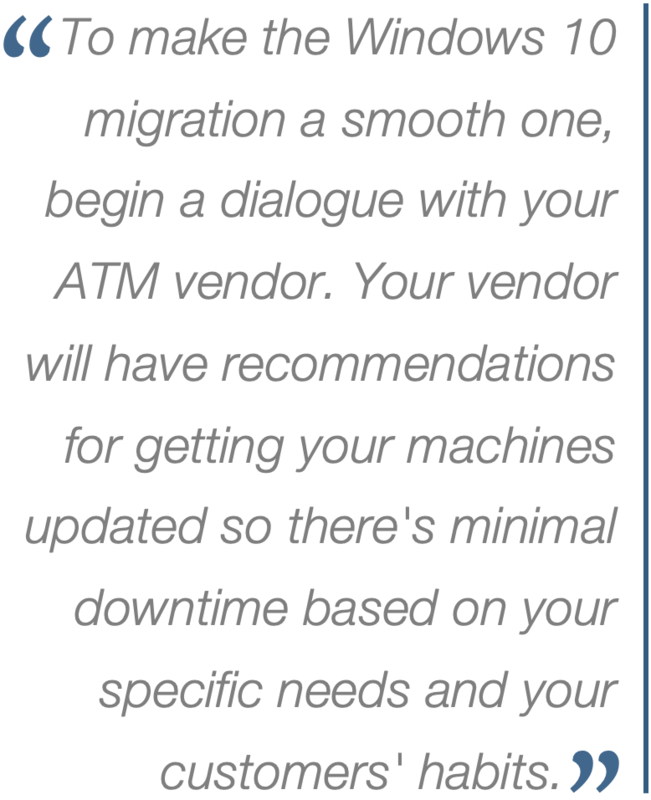 To make the Windows 10 migration a smooth one, begin a dialogue with your ATM vendor. Your vendor will have recommendations for getting your machines updated so there’s minimal downtime based on your specific needs and your customers’ habits.